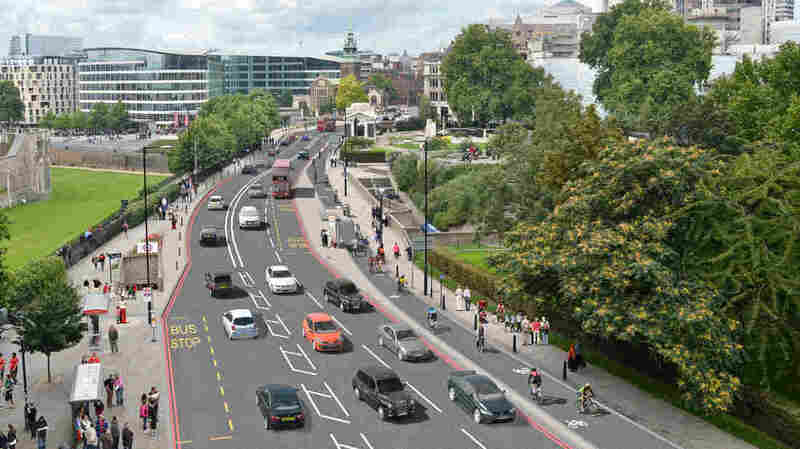 Bikes Only: London Approves New Cyclist Superhighway Plan : The Two-Way London Mayor Boris Johnson will change some of London's busiest roads and intersections, in a few cases banning all traffic except cyclists from making turns. An artist's conception shows the two-way cycle track on Tower Hill. The track is part of London's new plan to boost its bicycle infrastructure. London Mayor Boris Johnson's ambitious plan to reshape how the city handles cyclist traffic got final approval Wednesday, clearing the way for the spread of segregated bike lanes and dedicated traffic signals. Johnson plans to create a network for cyclists that rivals the city's transit system. "The board of Transport for London approved a plan to spend £160m (around $240 million) on segregated bike lanes," Britain's ITV reports. "The biggest investment will be on two controversial 'cycle superhighways' running east-west and north-south through central London." Overall, London plans to invest more than $6 billion in its Road Modernization Plan, which includes everything from replacing streetlights to revamping tunnels. The changes in bike infrastructure are extensive. 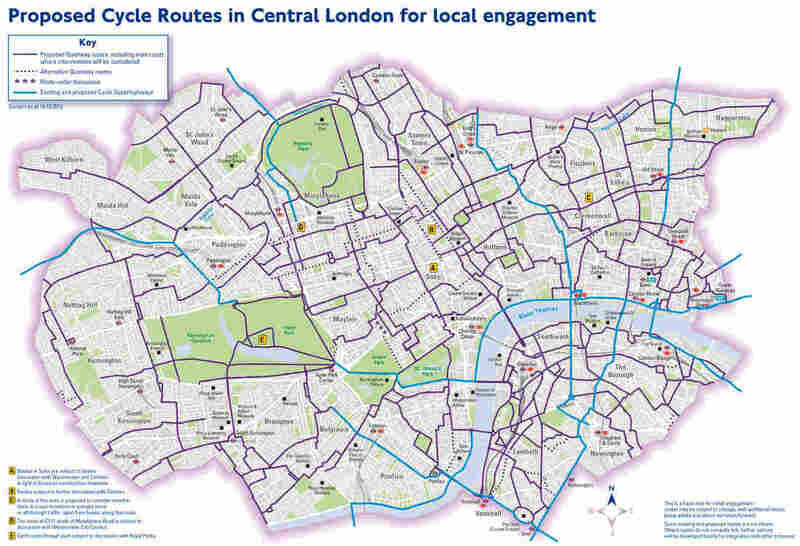 To get a sense of the scale, you can check out a PDF posted online by the Transport for London that highlights major shifts, such as bike routes that will take over space currently occupied by traffic lanes and rows of parking. A map of bike routes that exist or are planned in London as the city modernizes its roads. The mayor's plan will change some of London's busiest roads and intersections, in a few cases banning all traffic except cyclists from making turns that are currently legal. After the changes were announced in September, the plans faced criticism from groups that include taxi drivers and land developers. But the mayor says that a new plan submitted last month reduces traffic delays by 60 percent, compared to earlier versions. The city says 84 percent of the 21,500 people who responded to the cycling proposal were in favor (public opinion polls showed less enthusiasm, with 64 percent in favor). And new figures that were released this week that showed cycling, already popular in London, had grown in popularity another 10 percent, marking a fifth consecutive quarter of record gains. "These amazing numbers show how cyclists are becoming ubiquitous in London and prove, if further proof were needed, why we need to crack on with catering for them," Johnson said earlier this week. Some of the new superhighways could open next spring, as work will begin in March on building and upgrading bike paths. Along some stretches, blue-painted bike lanes will be divided from the main road by concrete curbs — something cycling advocates have urged. The number of people who ride bikes in London has more than doubled in the past decade — a group that includes the mayor. The move comes after a rise in cyclist deaths in the city in recent years. When NPR's Parallels blog reported on that trend late in 2013, an advocate said there was a pattern to the deaths. "They do happen on busy roads, and they do happen at junctions," Tom Bogdanovich of the London Cycling Campaign said. "And they do — very often — happen between very large vehicles and vulnerable road users like cyclists and pedestrians." Today, The Guardian reports that big trucks "form less than 5 percent of overall traffic in London but are involved in about half of all cyclist deaths."